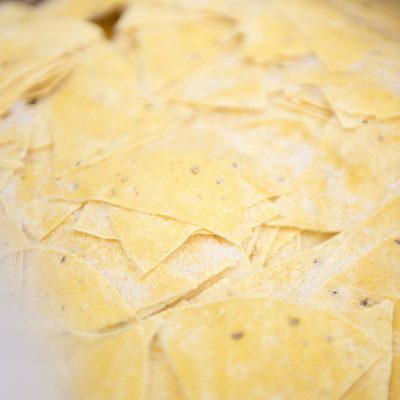 The corn or tortilla chip was first created as a way to use up left over tortilla dough. It was popularized by Rebecca Webb Carranza as a way to make use of misshapen tortillas rejected from the automated tortilla manufacturing machine. It was made, fried and sold and people have been enjoying chips ever since! Although first mass-produced in Los Angeles in the late 1940s, tortilla chips were always considered to be a Mexican food, known as totopos and tostadas. More commonly today, corns chips are popularised as packaged chips with different seasonings or on restaurant menus across the globe. The corn chip is something everyone can enjoy as some of them are actually gluten free. Flour tortilla chips include gluten, however, like most corn-based products, corn chips do not contain gluten. Making it a great alternative for coeliacs. The chips are usually made of yellow corn or flour but they can also be made of white, blue, or red corn. Some tortilla makers may include many other ingredients including wheat or sugar. It is so versatile and useful when it comes to eating dips, salsa, chile con queso, guacamole and nachos. Our Frozen pre cut Chips are perfect for those who love to warm-up and cook their own corn chips without the hassle of cutting and creating their own dough! You can have your corn chips made to order for any number of guests or customers! Just thaw before use and fry away. Our Frozen pre cut Chips will not only save you time but also money, when it comes to preparing meals quickly and efficiently. For a traditional corn chip taste, without the extra steps, try our Aztec Mexican corn chips! These chips are frozen and cannot be shipped. 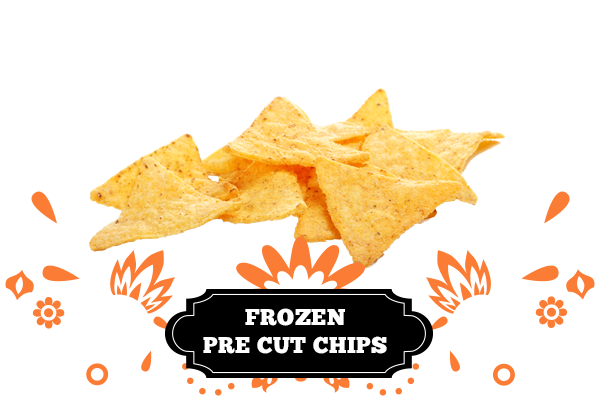 Contact us today to get an order of Frozen pre cut Chips.